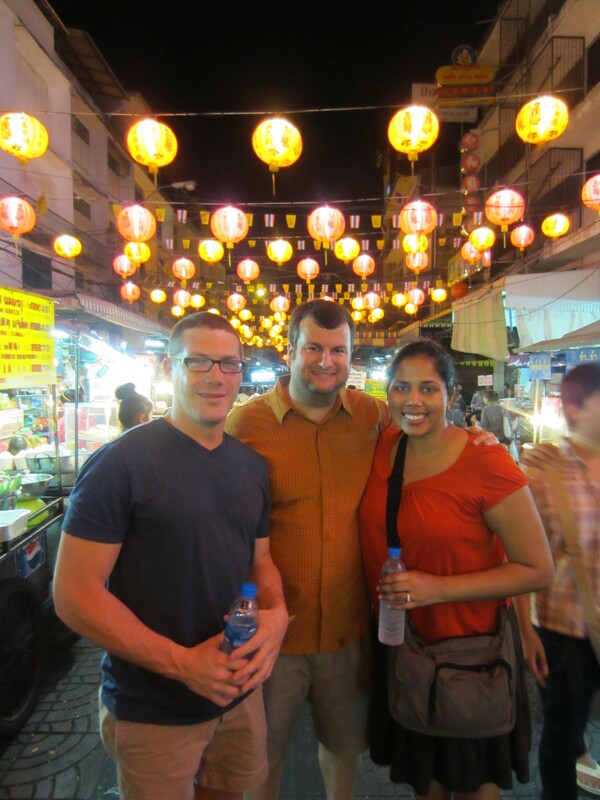 Sitting around the table of the final stop on our Bangrak Food Tour, the three of us agreed – joining this same outfit for their Chinatown Night Foodie Tour would immediately inject us into the heart of that cultural scene, too. Kavitha inquired about the availability of slots for us to join the tour the next night, as the tour max is 5. “Yes, we can fit you in,” they replied. The next night, after our cooking class that morning, we hopped onto the MRT (Bangkok’s subway system) and rode down to Hua Lamphong, at the end of the southern line. Waiting for us outside the exit was our guide, Gai. After introductions, he asked if we were ready to go – it turns out that we were the only three ln the tour that night! Our guide the day before, Olive, had warned us not to eat Gai, as Gai=chicken in Thai. As he told us, he was born in the Year of the Chicken, which is why his name is Gai. Our journey took us through alleys and thoroughfares in Chinatown, generally following Yarowat Rd., famous for its restaurants and street food vendors, especially at night. It’s shaped like a dragon, and the best stuff is exactly where it should be – the belly of the beast. 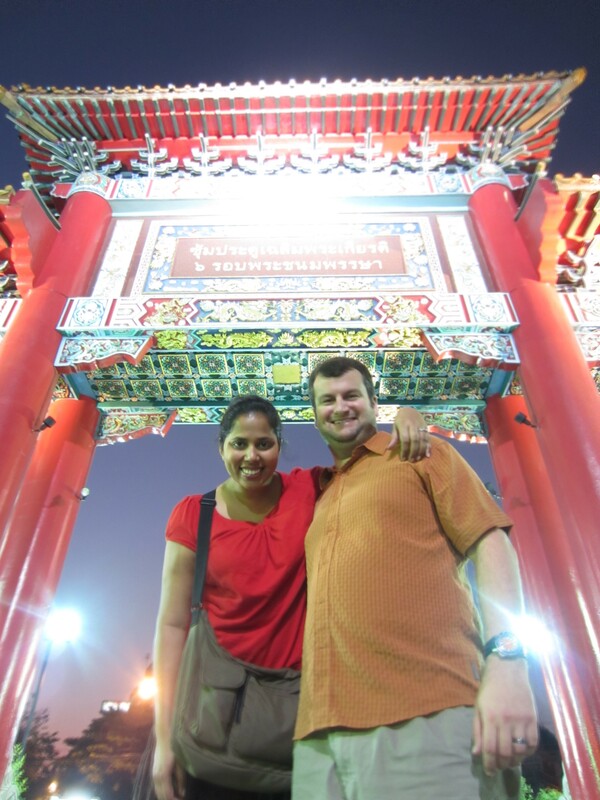 We started at the beautiful Chinatown gate and visited a special local temple with a Golden Buddha. Gai was a hoot – he was always offering awesome facts and history about the specific area or place we were visiting. He also, like Olive, took special care of us when crossing the road. With us right behind him, he’d lead the way across the street, hand slightly outstretched with an Obi Won Kenobi like presence. The Force is with him. We had well over 13 things all over the place. We feasted on pepper and crispy pork soup under a blanket of Chinese lanterns, balanced our Yang with our Yin drinking famous bitter herbal tea in a nondescript side street, and elbowed our way into sidewalk seats for enormous grilled prawns and stirfried morning glory. Our dim sum stop taught us that green tea noodles, shrimp, and black vinegar DO go together as a fabulous dumpling, and nibbling on durian out of the back of a pickup proved that nope, it’s still not that good. Kavitha fell in love with a dessert that has now become her favorite thing in Thailand – water chestnuts in coconut milk. It sounds totally weird, and it looks weird too, as the water chesnuts are coated with a pink rice flour, but it really is awesome. The feast was so awesome, in fact, that we went back to Chinatown on our own 4 nights later to close out our time in Bangkok. We re-racked a bunch of our favorites, and explored a few new dishes.